Ben has a mission to provide safe, ethical and sustainable behaviour training for horses, donkeys and mules worldwide by using the practical application of the science of behaviour. Like most equine people you probably want to understand more about equine behaviour so you can help your horse, donkey or mule, but you want an individual approach not a one size fits all method, and a trainer who actually "walks the talk", who will help you solve your horse training problems, develop your training skills and help your animal to reach their potential. Ben uses the practical application of horse and human behaviour to deliver horse training courses, workshops, clinics, home visits and books that are ethical and tailor made to individual training situations. Ben doesn't use horse training methods which are built on personal opinion, ego or showmanship. This isn't natural horsemanship and there are no pressure halters, just practical, proven horsemanship you can learn. Ben bases his horse training on the science of behaviour and on the natural principles of honesty, responsibility and common sense so that his equine training inspires behaviour change, both during training and for years afterwards. Learn more about how I work. Click here to listen to Ben's introduction to the website. By creating a better understanding of the art and science of equine behaviour and its practical application, Ben helps people, horses, donkeys and mules reach their true potential. The science of behaviour allows a truthful understanding of communication and learning both in equine and humans; the art of behaviour develops the feel that allows the practical application of the science. 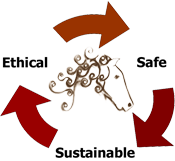 By teaching people, "how to think, rather than what to think," Ben allows people to solve their own horse training problems and develop their own unique equine solutions.